BULLETS - Pair of Aces design. Designed to be placed on your cards when in play. Made from solid metal with a shiny gold finish. Front is colourfully infilled and hand painted. Rear has an embossed Poker Card Guard coin finish. Has a satisfying weight, look and feel of quality. Comes in a Clear Acrylic case with foam surround for protection. Perfectly sized to fit in your pocket. Cased Card Guard Width: 51mm. Cased Card Guard Thickness: 8mm. Cased Card Guard Weight: 40g. 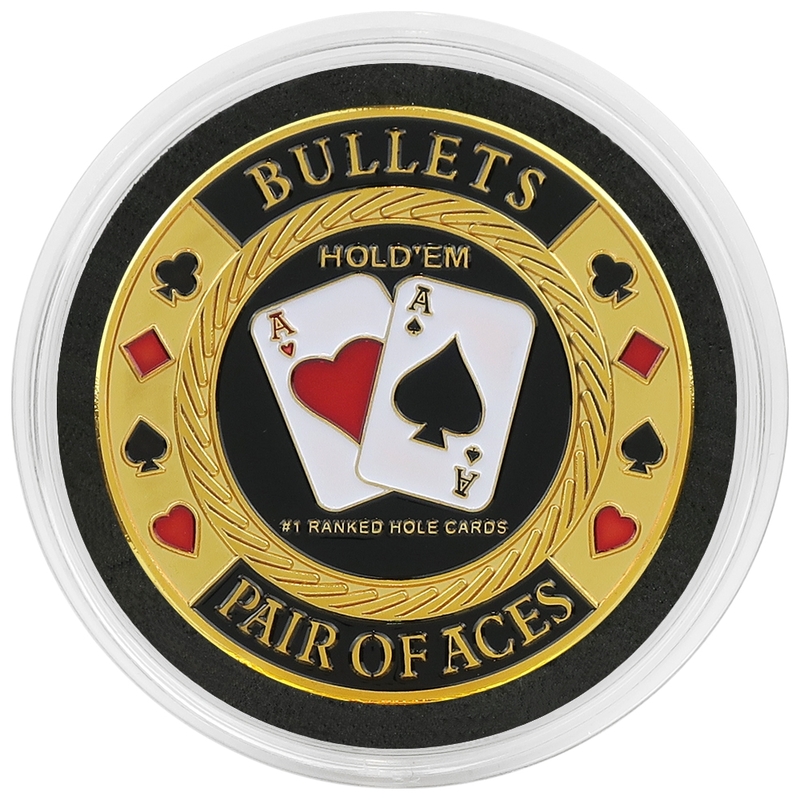 This BULLETS - Pair of Aces Poker Card Guard has been specifically designed to be placed on your hand and 'Guard' your cards which are in play so there is no question whether your in the game! When you are not actively looking at your cards, placing the Poker Card Guard on them stops anyone looking at your cards by mistake and tells the dealer you are definitely still in! Made from solid metal and finished in shiny gold, the design on the front is hand painted with a colourful infilled design, the rear has a Poker Card Guard coin finish. The Card Guard had a satisfying weight, look and feel which gives off an air or quality and comes in a clear plastic acrylic case with a foam surround to protect your Card Guard when not in use and perfectly sized to fit in your pocket. If your looking for a little something to indulge yourself or to buy as a gift, then look no further, this is the perfect item for you.